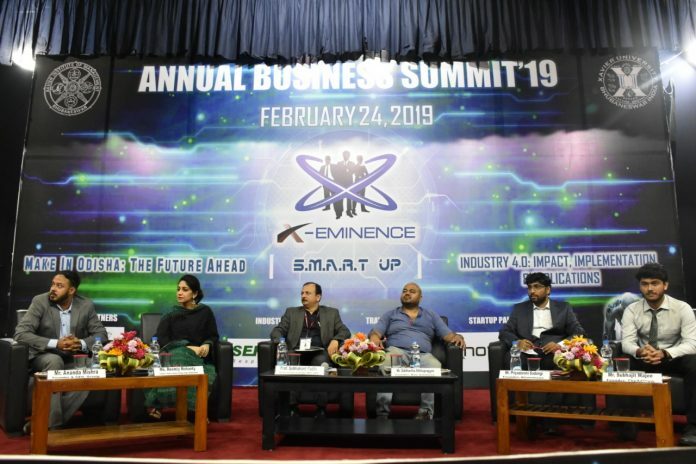 Bhubaneswar: XIM, Bhubaneswar was proud to host the Annual Business Summit which was organized by X-Eminence on the 24th of February 2019. This Summit was conducted by X-Eminence which had students pursuing the Executive-MBA course from XIM, Bhubaneswar. 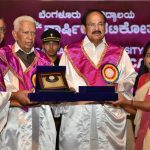 A diverse array of speakers were lined up to discuss and deliberate on various topics in an interactive session with the students. The event commenced with an inauguration ceremony with the traditional lighting of the lamp followed by a speech by the honourable chief guest, Shri Prafulla Samal, Minister, MSME, Women & Child Development, Govt. of Odisha. He enlightened us by saying that we should focus on the real Odisha which also comprises of the people who live in villages deprived of basic amenities. He highlighted how ‘Make in Odisha 2.0’ will create 6 lakh jobs and vowed for women empowerment and getting 1/3rd of start-ups by and for them. He also mentioned how the state should focus on the MSME sector in the near future. After a glowing first session, the panel discussion on “S.M.A.R.T. 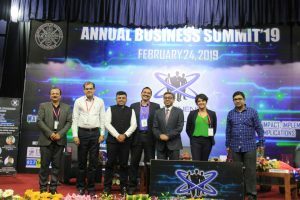 UP” moderated by Prof S K Padhi, Assopciate Dean Executive MBA followed which had emerging entrepreneurs as the panellists. The first speaker Priyadarshi Sadangi, Founder, Knowlexeon spoke about how creating an automated system, machine learning and data analytics/mining could help increase productivity by finding the predictive behaviour among the customers. Subhajit Majee, the founder of ‘The Adview’ which he started with only 800 rupees and made it into a company which had a turnover of 8 crores last mentioned incorrect positioning as the issue, where everything revolves around advertisements when it should be around finding what the customer actually thinks. Interesting ideas were shared by Ananda Mishra, Founder, Grozip where he asked students to “Focus more on people, rather than revenues and profits”, “Connect the vendors to the sellers with an automated system” and the fact that “Customer satisfaction is paramount”. He was followed by Reemly Mohanty, Founder, Reemly’s Design Studio who started her company in 2011 with a small workshop and 3 workers. She shared her story of how she grew keeping in mind 3 crucial aspects-‘Digital marketing’, ‘Word-of-mouth Influence’ and ‘Customer Satisfaction’. The last speaker, Siddhartha Stithapragyan, Founder, Max Solutions shed lights on convertibility of data into value using various data mining tools and techniques. He also presented the analogy of start-ups with a human baby; first 6 months of any product/service life being extremely crucial. The last but the most interesting session talked about “Industry 4.0: Impact, Implementation & Implications”. The first speaker was Rudra Narayan Pilai, Special Secretary, E & IT Dept., Govt. of Odisha who put up his thoughts mentioning Industry 4.0 is driven by stakeholders and Government is one of the stakeholders as it provides re-skilling opportunities playing the roles of an enabler, facilitator, and policy maker. Dhinakar Ramamurthy, Head, Digital Transformation Renault Nissan Mitsubishi Alliance, India grabbed the attention of the students by talking about Digital twins and how the change in data could be applied in production. Ramesh Kollana, Delivery Head, Mfg & Auto Assurance, Tata Consultancy Services stated an analogy which said as history tends to repeat itself, similarly in IT, concepts metamorphose into new buzz words. Padmaja Mishra, Director, Risk Advisory, Deloitte, put up the fact that we live in times of unprecedented change, and hence should be open for new technologies with a wider vision. Somnath Mitra, Industry 4.0 Consultant, Former VP, Yes Bank, discussed a case to bring out the importance of industry 4.0. The enriching and thought-provoking speeches were followed by an interactive Q&A session with the guest speakers answering the thoughtful and intriguing questions posed by the students. The event concluded with a vote of thanks delivered by X-Eminence, XIMB.